Il y a dans le document de PwC un exposé clair des principales tendances en gouvernance au cours des prochaines années. Le site de PwC présente également les chapitres individuels du rapport. In the summer of 2014, 863 public company directors responded to our survey. Of those directors, 70% serve on the boards of companies with more than $1 billion in annual revenue, and participants represented nearly two-dozen industries. 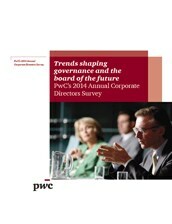 In PwC’s 2014 Annual Corporate Directors Survey, directors share their views on governance trends that we believe will impact the board of the future, including: board performance and diversity, board priorities and practices, IT and cybersecurity oversight, strategy and risk oversight, and executive compensation and director communications. Many boards are giving even more attention to enhancing their own performance and acting on issues identified in their self-assessments. Board composition is under pressure to evolve to meet new business challenges and stakeholder expectations. Today’s directors are more focused than ever on ensuring their boards have the right expertise and experience to be effective. Stakeholders are more interested in board diversity, and boards are increasingly focused on recruiting directors with diversity of background and experience. Director performance continues to face scrutiny from investors, regulators, and other stakeholders, causing board practices to remain in the spotlight. With over $100 billion in assets under activist management1, more directors are discussing how to deal with potential activist campaigns. Companies and directors increasingly see IT as inextricably wed to corporate strategy and the company’s business. IT is now a business issue, not just a technology issue. Cybersecurity breaches are regularly and prominently in the news. And directors are searching for answers on how to provide effective oversight in this area. Risk management is a top priority for investors, and they have high expectations of boards in this regard. Effective oversight requires that the board receive the right information from management to effectively address key elements of strategy. Boards are devoting even more time and attention to the critical issue of appropriate compensation. Stakeholders are showing continuing interest in how proxy advisory firms operate. The interest of stakeholders in the proxy advisory industry is a key trend. « Gouverner dans l’anxiété | Effet insoupçonné de l’actionnariat activiste ?